To view a listing of objects without the introductory text, click here. In 1889 T. Tokuno [Tokunô Tsûshô (Michimasa) 得能通昌], head of the Japanese bureau of engraving and printing (Insatsukyoku, part of the government Ministry of Finance) presented the Smithsonian with a remarkable group of wood blocks, color prints, sample pigments, and related tools. Some additional pigments and several books and prints issued by the Printing Bureau were received in 1890. These objects went on exhibition almost at once and were featured as part of the permanent Graphic Arts exhibition of printmaking techniques for more than a century. They were on view from 1889 to 1913 in the U. S. National Museum (now the Arts & Industries Building), then moved to the Smithsonian Castle for several decades, and after 1964 they were installed in the new Museum of History & Technology, now the National Museum of American History (NMAH). Life-sized mannequins were made for the exhibition, the printer about 1917 and the block cutter in 1919. Original drawings from the initial gift provided a useful guide to position the figures of the block-cutter and printer. All of these objects were placed in storage during the late 1990s, shortly before the NMAH Hall of Printing and Graphic Arts closed in 2003. These watercolors were included as part of the gift and aided curators in accurately creating mannequins and exhibiting the Tokuno gift. Asian art is primarily collected and exhibited at the Smithsonian’s Freer Gallery of Art (opened in 1923) and the Arthur M. Sackler Gallery (opened in 1987). The mandate for the NMAH Division of Graphic Arts – the oldest print-collecting unit at the Smithsonian – has always been to document and interpret printing and printmaking in all periods and countries. Although the museum’s name changed in 1980 from the Museum of History & Technology to the National Museum of American History, the collection remains international in scope, and it includes prints, plates, blocks, and tools representing many graphic processes used worldwide. Left: The printer’s cabinet displayed the tools associated with his craft. Right: Exhibition with mannequins displaying the Tokuno gift at the Smithsonian Castle ca 1920. The history of 19th- and early 20th-century museum presentations of Japanese works in the West is not well documented, but we believe that the NMAH collection represents one of the earliest examples of Japanese wood blocks, prints, and tools on exhibition in the United States, if not the world. Beyond the Tokuno gifts, the collection includes a few prints and printmaking tools collected by Commodore Matthew C. Perry’s naval expedition to Japan in the 1850s that have been part of the Smithsonian collection since 1867, although their exhibition history is unclear. A group of wood blocks exhibited at the Centennial Exposition in Philadelphia in 1876 by the Japanese Bureau of Education came to the Smithsonian much later, through the U. S. Department of the Interior, in 1910. Two European museums—the Rijksmuseum voor Volkenkunde in Leiden, The Netherlands, and London’s Victoria & Albert Museum—have collections of Japanese prints, woodblocks, and tools, but no history of these exhibitions has been published. Some examples of Japanese woodblocks were included in Dutch museum collections during the 19th century but they seem to have been interpreted solely as ethnographic artifacts. The V&A exhibition of Japanese prints and blocks went on view in the early years of the 20th century, about two decades after the Smithsonian’s exhibition opened. Further research into the history of museum exhibitions of Japanese printmaking techniques is necessary to enhance our understanding of their important influence on visual culture. 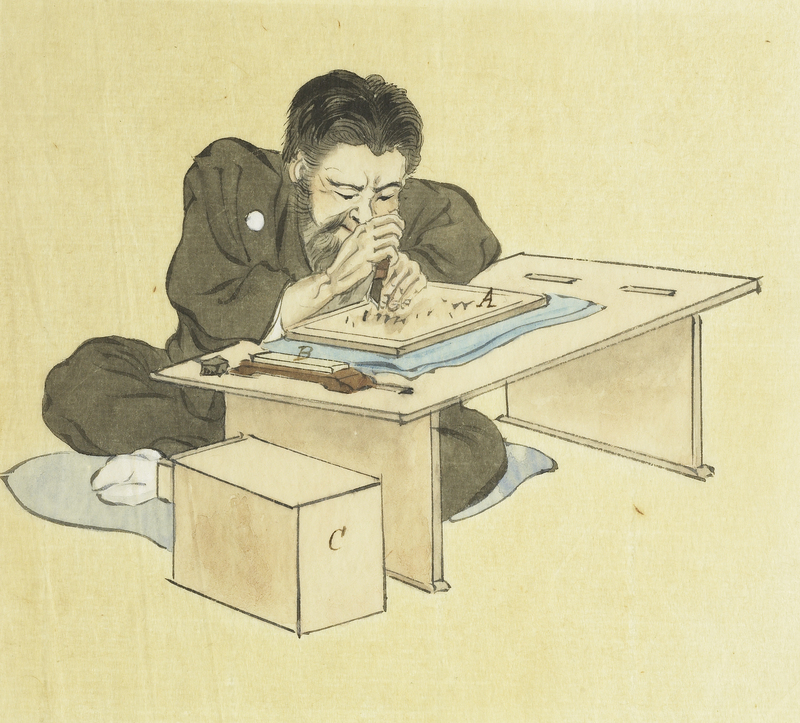 Watercolor drawing depicting the activities of the block cutter for Japanese printmaking. Identified as "Fig. I". One of a series of drawings received about 1890 that later were used to model manikins and lay out the Graphic Arts exhibit of Japanese printmaking techniques. Published in Tokuno essay on Japanese woodcutting and wood-cut printing, edited by S. R. Koehler for SI Annual Report for 1892. Watercolor drawing depicting the tools of the block cutter for Japanese printmaking. Identified as "Fig. II" with 25 numbered drawings of tools. The tools are catalogued as GA*03210.01-.25. This drawing was published in Tokuno essay on Japanese woodcutting and wood-cut printing, edited by S. R. Koehler for SI Annual Report for 1892. One of a series of drawings received about 1890 that later were used to lay out the Graphic Arts exhibit of Japanese printmaking techniques. 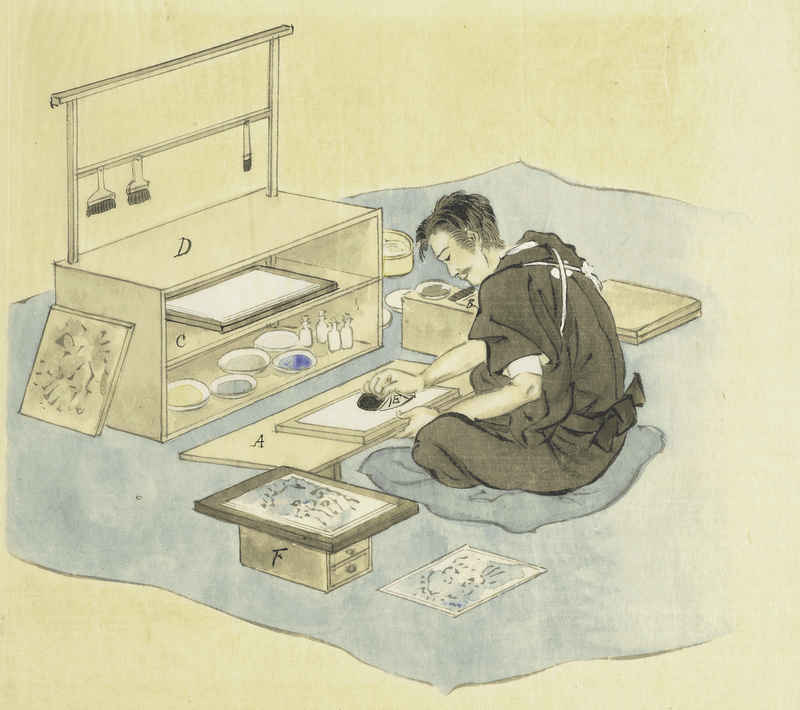 Watercolor drawing depicting the activities of the block printer for Japanese printmaking. Identified as "Fig. III" . Published in Tokuno essay on Japanese woodcutting and wood-cut printing, edited by S. R. Koehler for SI Annual Report for 1892. One of a series of drawings received about 1890 that later were used to model manikins and lay out the Graphic Arts exhibit of Japanese printmaking techniques. Printer shown seated with his furniture and tools. Watercolor drawing depicting the tools of the block printer for Japanese printmaking. Identified as "Fig. IV" with 17 numbered drawings of tools and furniture which are catalogued as GA*03211.01-.17. This drawing was published in Tokuno essay on Japanese woodcutting and wood-cut printing, edited by S. R. Koehler for SI Annual Report for 1892. One of a series of drawings received about 1890 that later were used to lay out the Graphic Arts exhibit of Japanese printmaking techniques. Straightedge, steel, for cutting straight lines and for fixing registration marks on the blocks used in color printing. Woodblock-cutter's tool used in Graphic Arts exhibit of Japanese printmaking techniques from about 1890 to 1990s. Identified as No. 1 in watercolor drawing GA 03209.02 showing the tools of the block cutter. Old paper label "No. 1"
Wooden brush used for removing wood shavings during block cutting for Japanese printmaking. Bristles held in place by diagonal stitches. Fragment of paper label on handle. Woodblock-cutter's tool used in Graphic Arts exhibit of Japanese printmaking techniques from about 1890 to 1990s. Identified as No. 2 in watercolor drawing GA 03209.02 showing the tools of the block cutter. Wooden handle for engraver's knife for cutting design in woodblock. Round, tapered, wooden handle only; cutting blade missing. One of a group of woodblock-cutter's tools used in Graphic Arts exhibit of Japanese printmaking techniques from about 1890 to 1990s. Identified as No. 3 in watercolor drawing GA 03209.02 showing the tools of the block cutter. Wooden handle with V-shaped chisel for removing small bits of wood between the lines of the design of a woodblock. One of a group of woodblock-cutter's tools used in Graphic Arts exhibit of Japanese printmaking techniques from about 1890 to 1990s. Identified as No. 4 in watercolor drawing GA 03209.02 showing the tools of the block cutter. Wooden handle with U-shaped chisel for removing small bits of wood between the lines of the design of a woodblock. One of a group of woodblock-cutter's tools used in Graphic Arts exhibit of Japanese printmaking techniques from about 1890 to 1990s. Identified as No. 5 in watercolor drawing GA 03209.02 showing the tools of the block cutter. Wooden handle with metal blade, flat, narrow chisel for removing small bits of wood between the lines of the design of a woodblock. One of a group of woodblock-cutter's tools used in Graphic Arts exhibit of Japanese printmaking techniques from about 1890 to 1990s. Identified as No. 8 in watercolor drawing GA 03209.02 showing the tools of the block cutter.